Red Wheel ∕ Weiser Online Bookstore | Babylonian Magic and Sorcery by Leonard W. King, M.A. 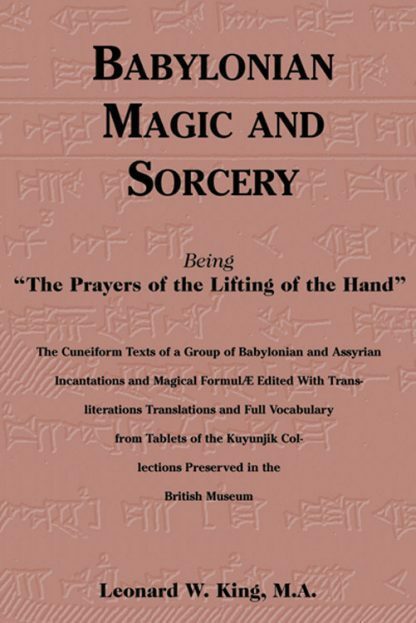 First published in 1896, King presents the cuneiform text of a group of 60 clay tablets inscribed with prayers and religious compositions of a devotional and magical character. These tablets were created by the scribes of Ashurbanipal, King of Assyria, between 669-625 b.c., and are currently part of the Kuyunjik collection in the British Museum. King's illustrations feature a transliteration of each tablet with an English translation of well-preserved passages. King includes a Babylonian-English glossary, a list of proper names and numerals with their corresponding cuneiform inscriptions, and a list of words and word portions of uncertain translation. King (1869-1919) was Assistant Keeper of Egyptian and Assyrian Antiquities, British Museum; Professor of Assyrian and Babylonian Archaeology at the University of London, King's College.